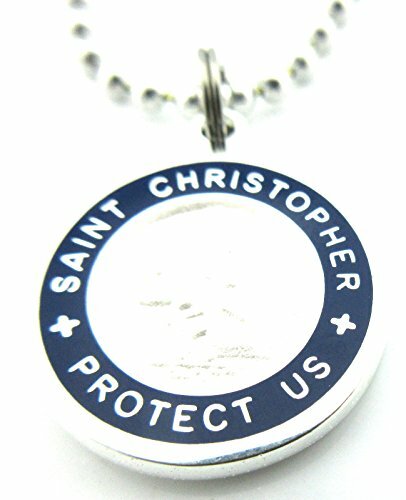 St. Christopher is widely known as the Patron Saint of Travel. This iconic medal was worn in the 60's by surfers and adventurers, commonly thought of as a good luck charm. Guys and Girls would exchange them as a symbol of "going steady". Medium and Large size feature a stamped surfer back (as pictured). Each silver plated pendant necklace includes an adjustable ball link chain and comes poly bagged with a story hangtag. Traditional brilliant hard enamel coloring. Crisp tooling ensures crystal clear lettering and detailed center. If you have any questions about this product by Get Back Supply Co, contact us by completing and submitting the form below. If you are looking for a specif part number, please include it with your message.